Cats or dogs? Boxers or briefs? Window seat or aisle? Having a preference of one over the other reveals quite a bit about you. But it's the hot dog versus burger debate that may be the most contentious and pointed of our time, possibly rivaling the age-old argument over whether or not a hot dog is a sandwich. Now, thanks to some intrepid research from one of the country's biggest grocery stores, we can settle once and for all just who's on team hot dog and who's on team hamburger around the country, thanks to a new map that reveals which states prefer one over the other. 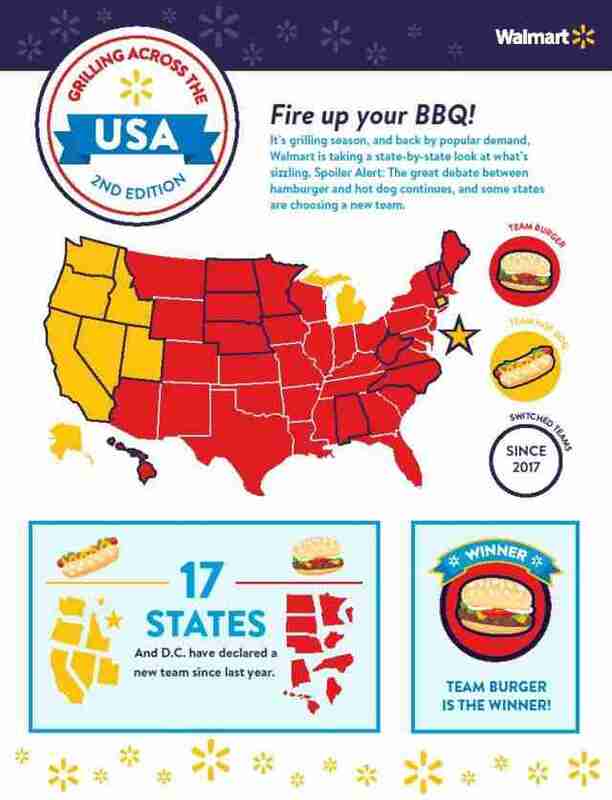 A new infographic from Walmart pulls back the curtain on just how our collective preferences pan out, mapping which states prefer hot dogs over hamburgers and vice versa using sales data from its stores around the country. 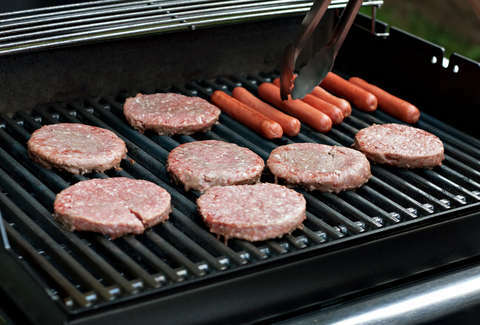 And good news for the burger-lovin' BBQ fiends out there: according to this groundbreaking study, burgers are the preferred grilled meat in the good ol' US of A. Specifically, burgers won out over dogs in a whopping 41 states, with hot dogs coming out on top primarily in the Western part of the country (Washington, Oregon, Idaho, California, Nevada, Utah, and Alaska all love their 'dogs), as well as in Michigan and Washington, D.C. However, this tally could very well change in a year, considering the same research conducted last summer reveals 17 states flip-flopped on their favorites from just 12 months ago. The sales data Walmart used to make the map also provided some other interesting intel. For instance, it suggests millennial shoppers are more into grilled chicken than other generations, and skip buying condiments like mayo, ketchup, or mustard. Meanwhile, nearly 10% of all millennials and boomers are into buying veggie dogs and burgers. Obviously, it's impossible to declare entire states as team burger or hot dog using this sort of anecdotal evidence, but it's the best way we have to prove it one way or another unless someone can convince the government to add that question to the 2020 census.